The best lobster bisque recipe has its roots in French tradition. 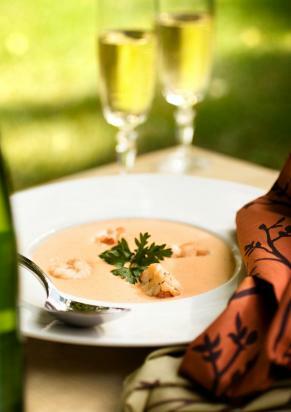 Bisque is a French word for a creamy, pureed soup made with crustaceans, cream and a blend of herbs and spices with a subtle nuance of flamed wine and brandy. The preferred choices are sherry and cognac; however, some favor a dry white wine. This is an elegant lobster bisque recipe rooted in classical French cuisine. It features wholesome ingredients, a sweet lobster stock and moderate culinary techniques. Moreover, the recipe does not call for a thickener like roux, but embraces the French tradition of simmering lobster shells in the soup. In a saucepan over medium-high heat, sauté the lobster shells (or combination of shells and meat) in butter with onion, carrot, celery and garlic for two minutes. Add the dry white wine and simmer until shells are bright red and vegetables are softened. In a second saucepan, add the water, chopped tomatoes, peppercorns and herbs. Bring the liquid to a boil and reduce heat to a simmer. Fold lobster-vegetable mixture into the stock base and simmer until the stock is reduced by half (at least an hour). Add the coarse salt to taste. With a colander, strain the solids from the stock several times. Refrigerate the lobster stock for up to four days or freeze in airtight containers. In a large pot, add water and bring it to a rolling boil. Add lobsters to the water; cook until the shells are red and the meat is opaque. Remove lobsters and set aside to cool. Set aside one cup of the lobster liquid and cool. Remove the claw and tail from each lobster and reserve the juices. Refrigerate the claws and tails for future use. Remove remaining shells from lobster bodies; refrigerate the lobster meat for future use. Finely chop the lobster shells and set aside with the lobster juices. Alternatively, grind the lobster shells to a fine or course powder. In a large heavy skillet, melt the butter over high heat. Add the lobster shells and cook until browned. Add the scallions and garlic and sauté the vegetables until just tender. Flambé brandy in the pan and stir in the sherry. Simmer until the spirits are nearly evaporated. Fold in the lobster stock (or other seafood stock), lobster water and juices, add cayenne and Worcestershire and simmer over low heat for one hour. Strain any remaining solids from the lobster bisque and return soup to a pan. Add the heavy cream and salt to taste and slowly heat the bisque and simmer for 15 minutes. Garnish lobster bisque with fresh chives. Lobster bisque is delightful served as a main course dish for lunch; pair it with a Tarragon lobster salad. Bisque is also a pleasing addition to a full course French menu. With dinner, lobster bisque is best paired with an oaked French Chardonnay.